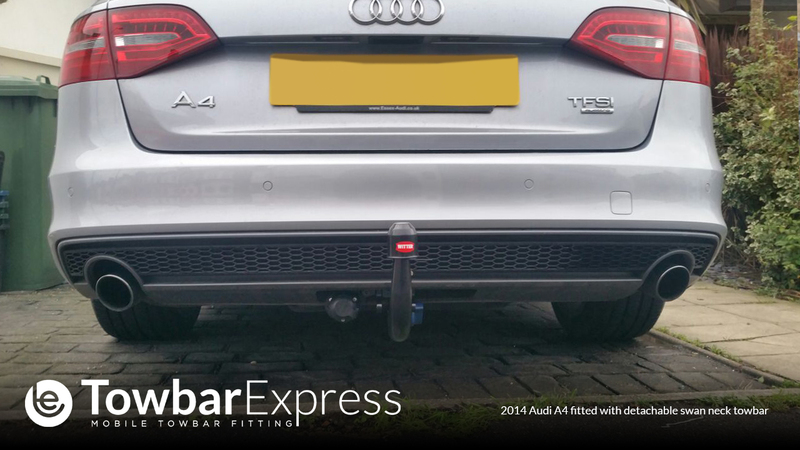 From the Audi A1 to the Audi Q7, we have towbars available for most Audi models. 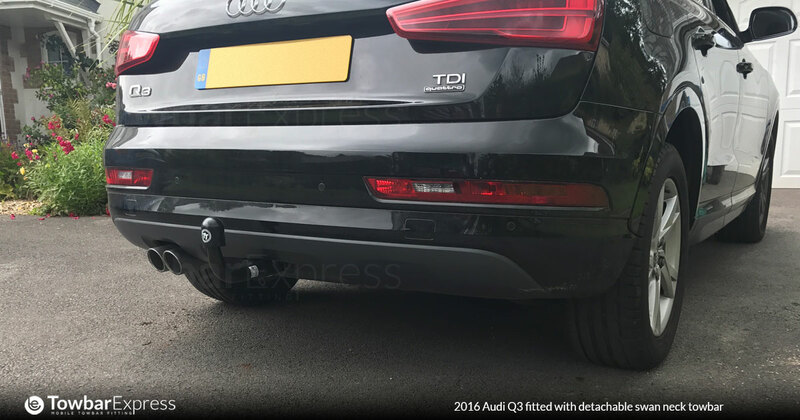 Towbars are available in swan neck and flangeball styles and are available in either fixed or detachable option for most models. 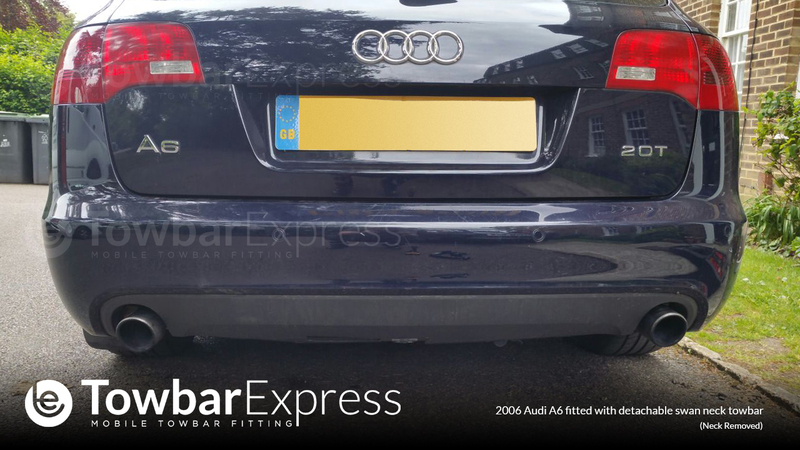 All towbars for your Audi are Type Approved where appropriate - guaranteeing your safety and optimal fitment to your car. 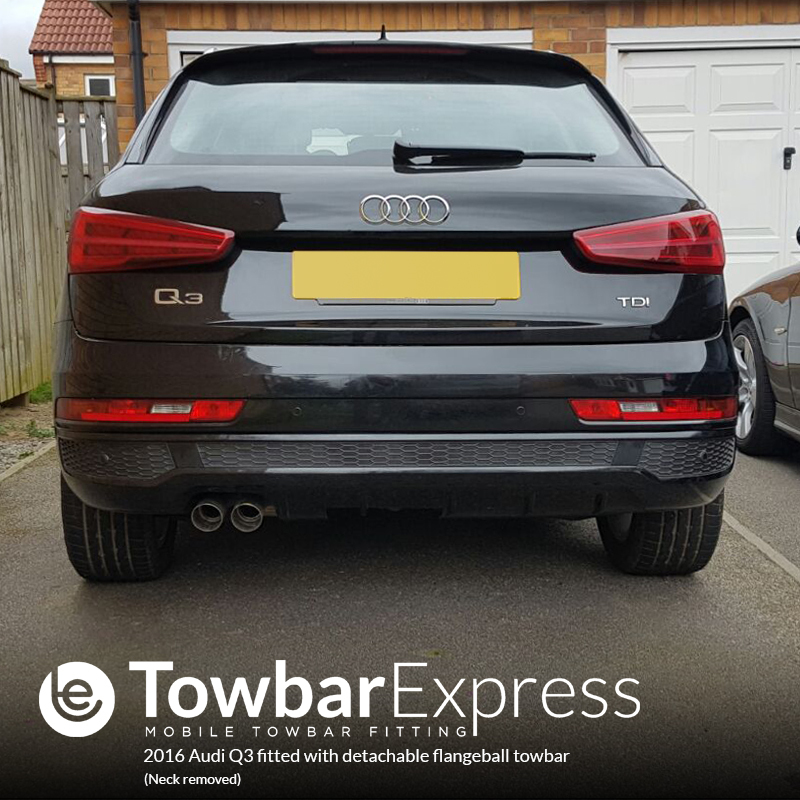 Our towbars are specifically designed for each model, and always mount to the points on the car that are specified by the manufacturer. 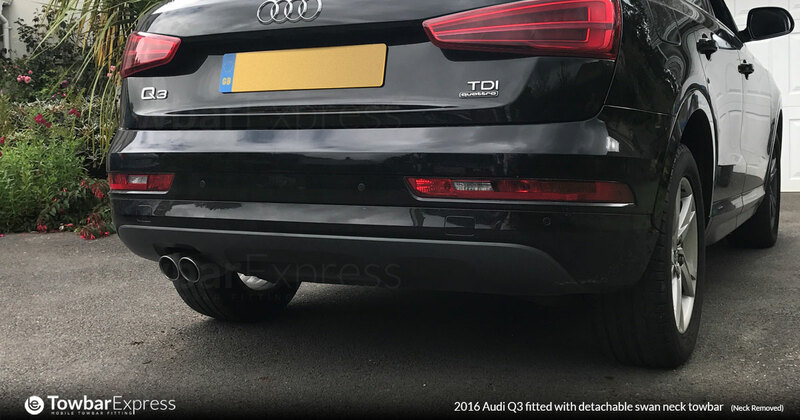 We are not a mail order 'supply only' service, the prices you see below include professional fitting at your home or work. 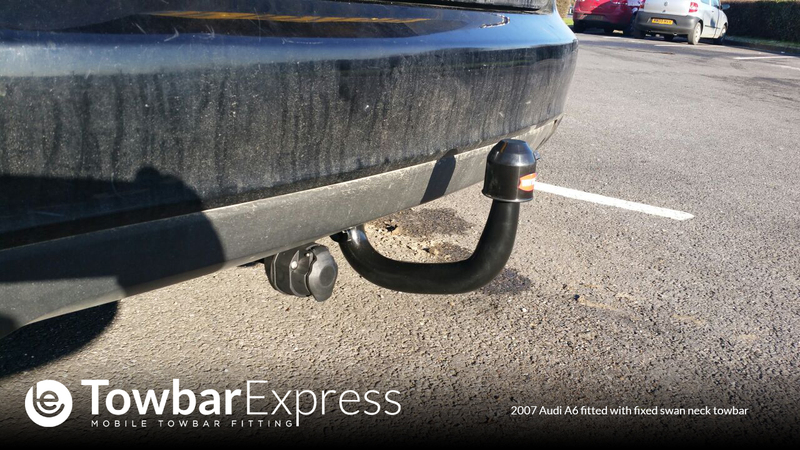 Our tow bar experts come to a location that suits you, saving you time and money. 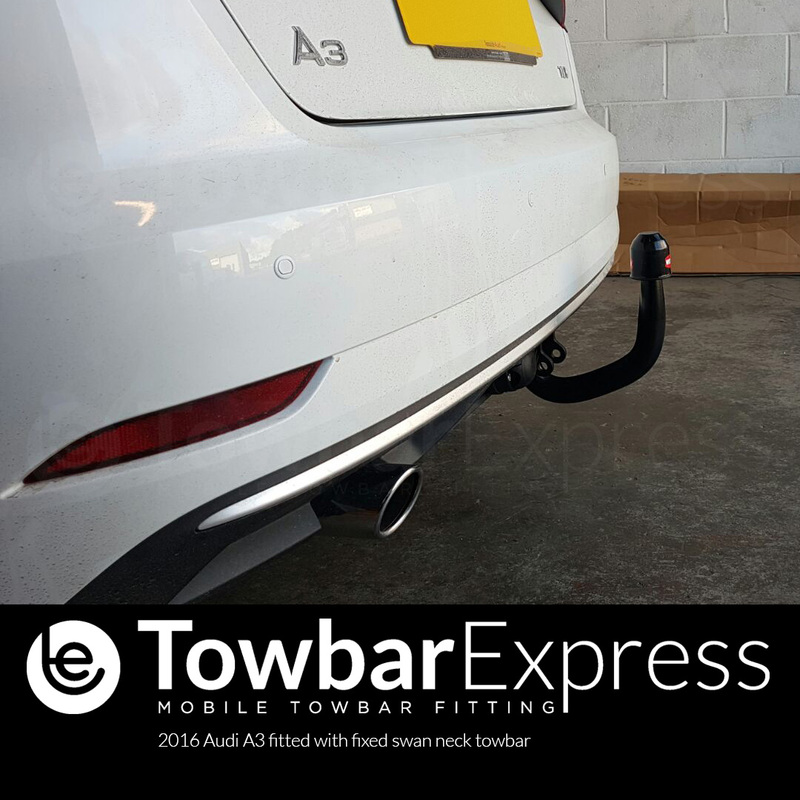 All of our technicians are employed directly by us, and we will not contract out the fitting of your tow bar to a 3rd party company, we take care of the whole job for you. 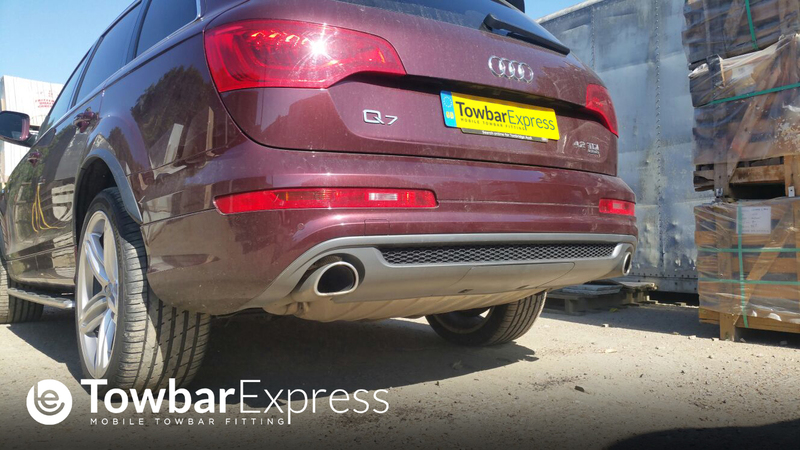 If you want to learn more about towbars, just click here. 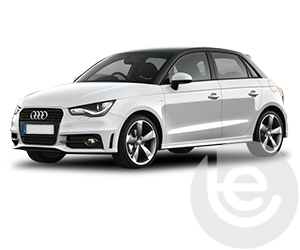 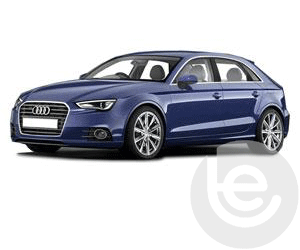 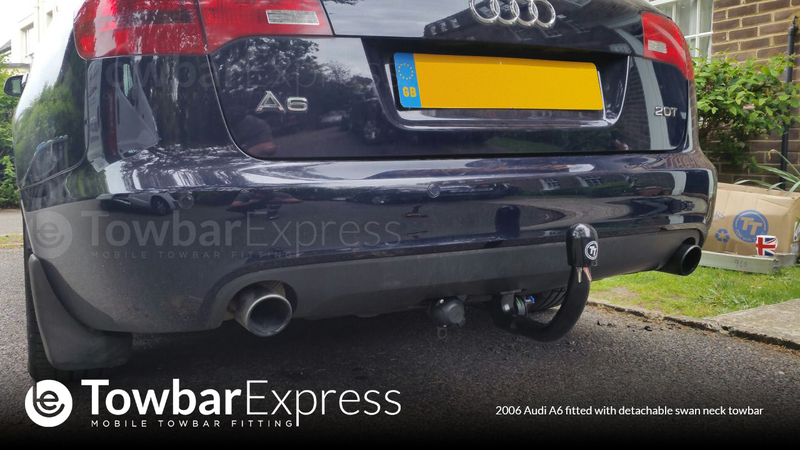 View our range of towbars and electrics for your Audi A3 from 1996 to present from fixed to detachable tow bars. 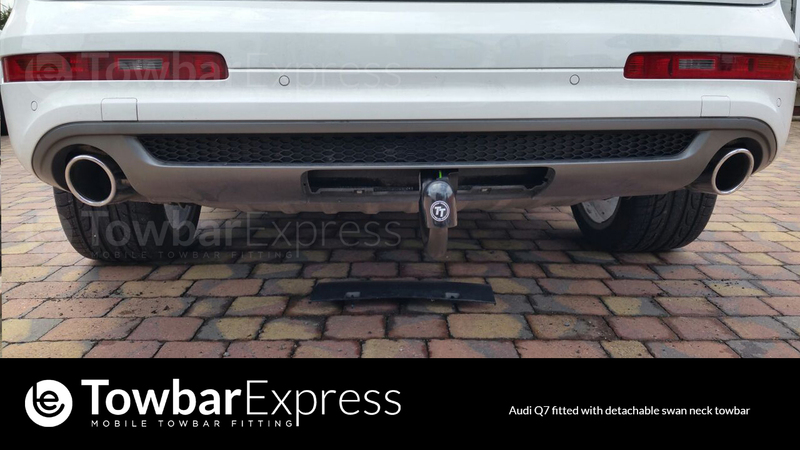 Audi A6 towbars for models from 1997 to present including all electrics and towbar types. 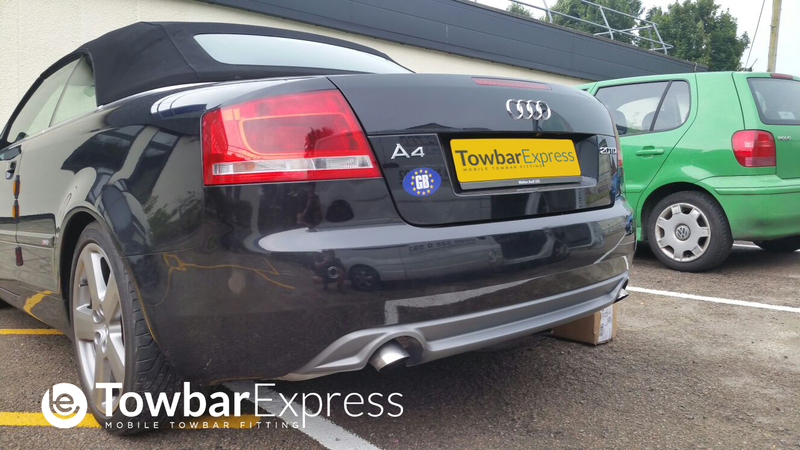 We stock a full range of towbars and towing electrics to fit your Audi A4 Vehicle. 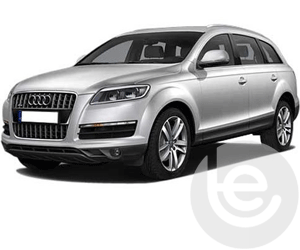 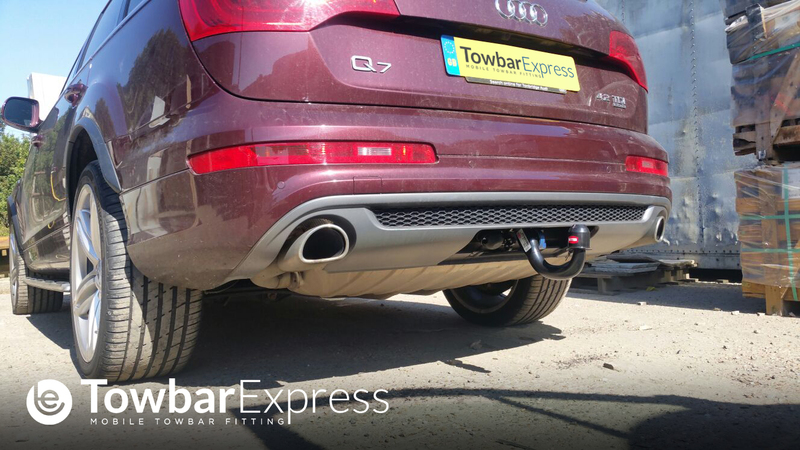 We stock a great range of Audi Q7 towbars including flange towbars and detachable swan necks. 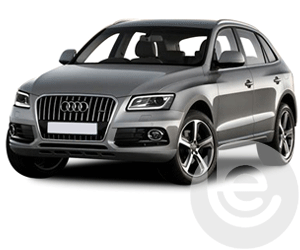 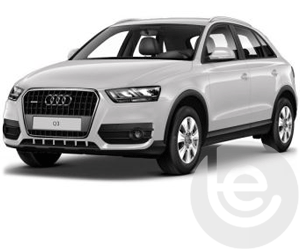 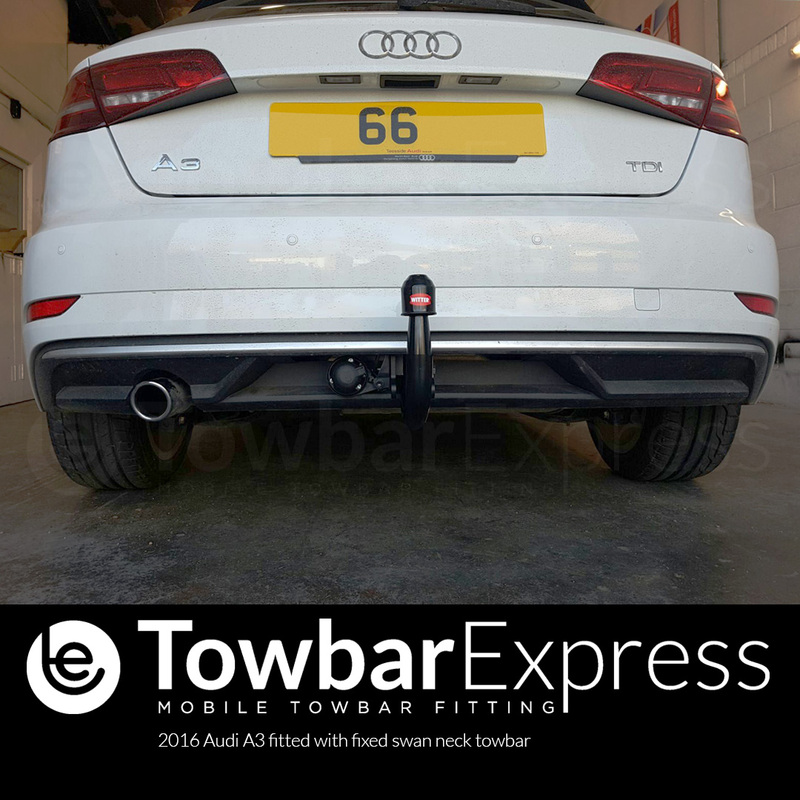 To find the towbar fitting price for your Audi, simply select your model below. 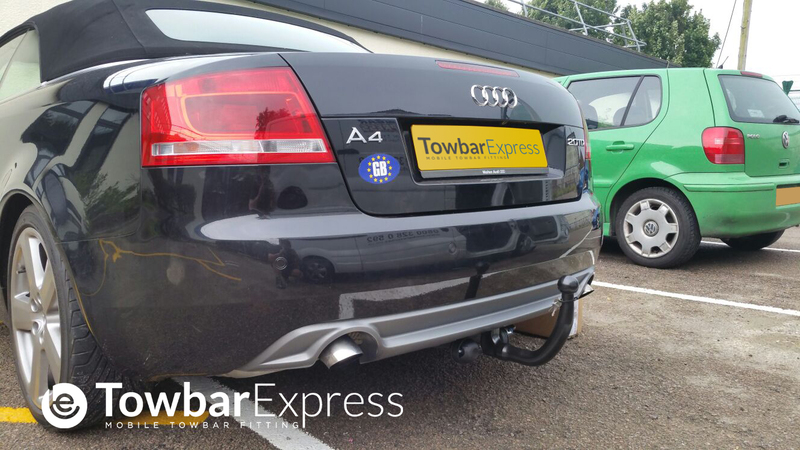 Which towbar for your Audi? 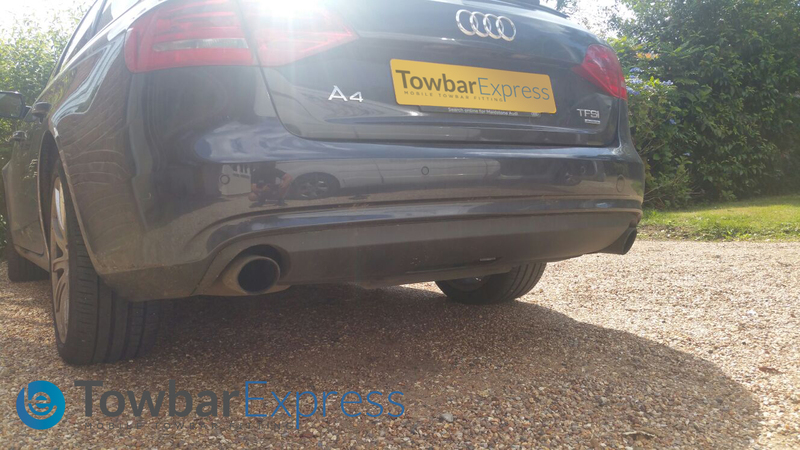 At Towbar Express we fit 100's of towbars every week all around the country. 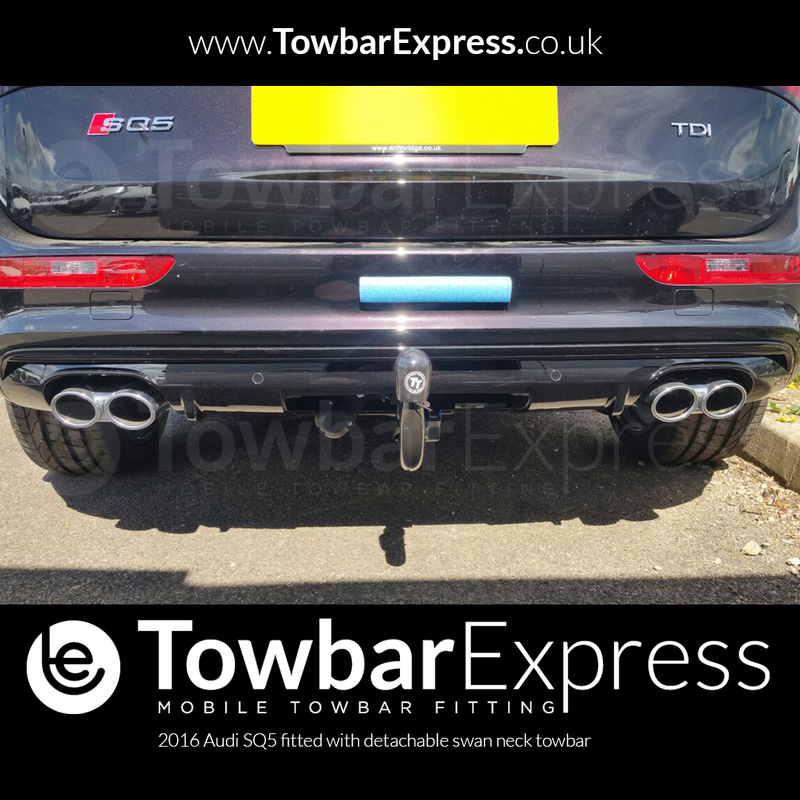 We have vast experience in all aspects of tow bar fitting, and towing electrics. 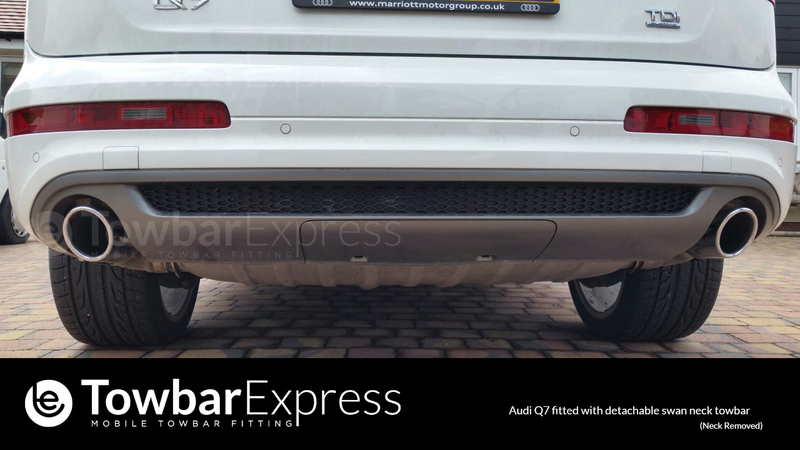 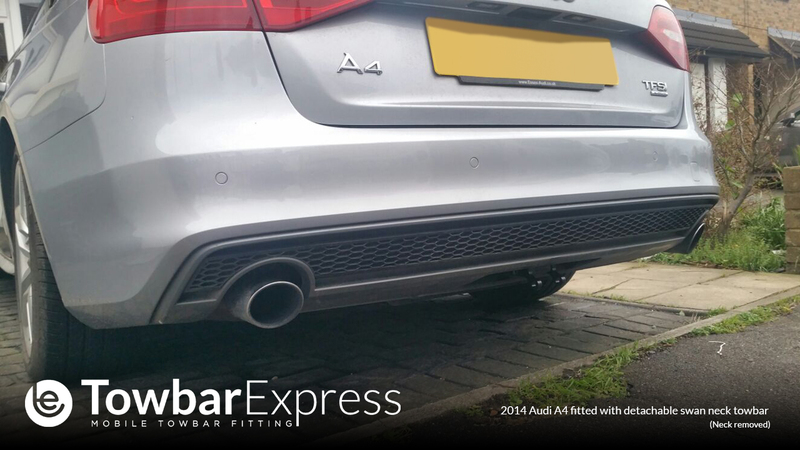 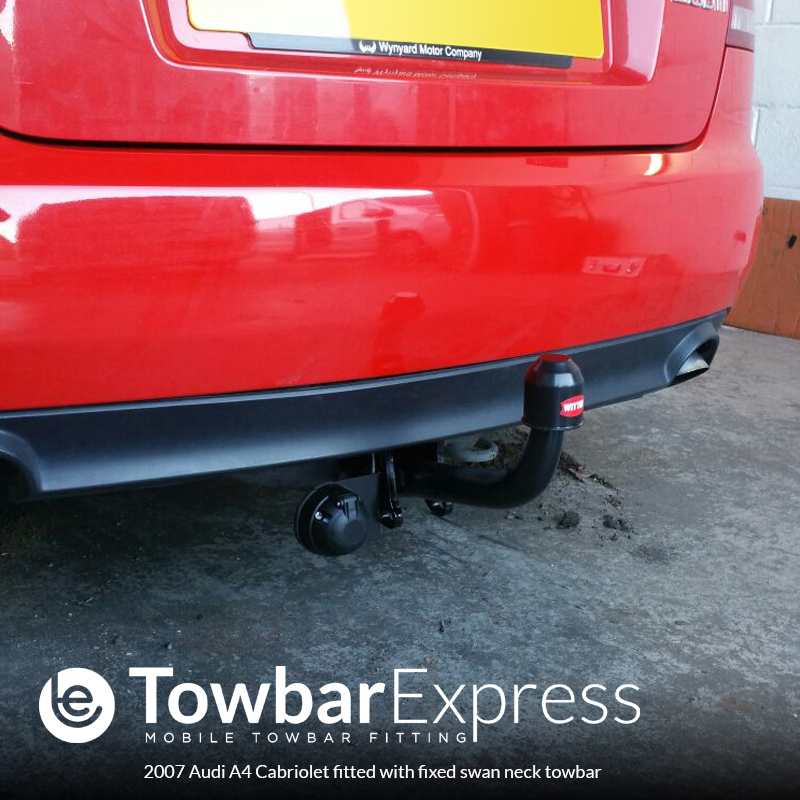 No one is more qualified than us to fit a towbar to your Audi. 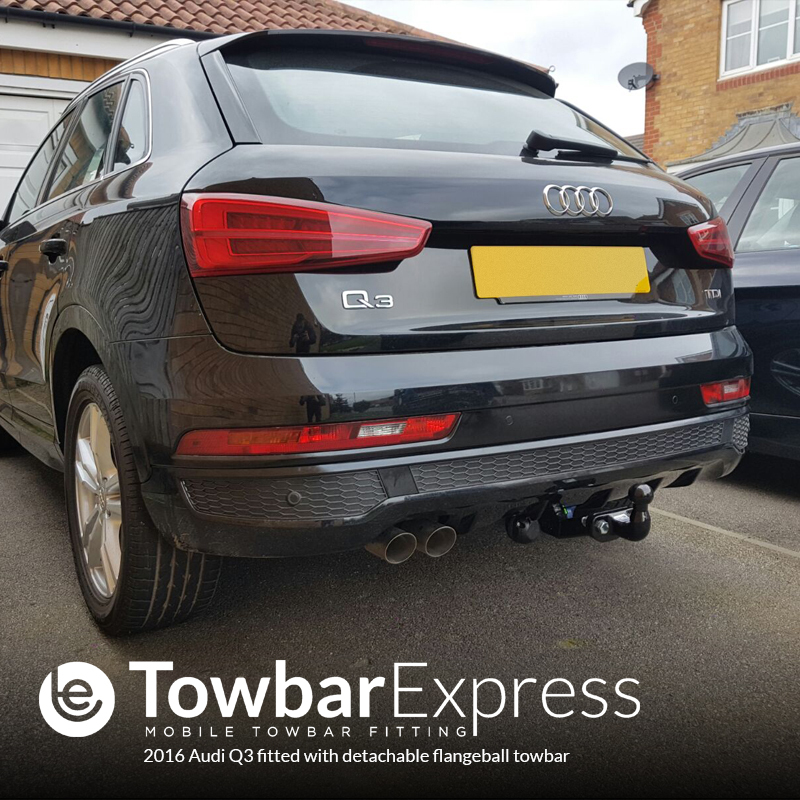 All of our Audi tow bar installations are fully guaranteed, and have the technical back-up from the UK's largest mobile towbar fitting company. 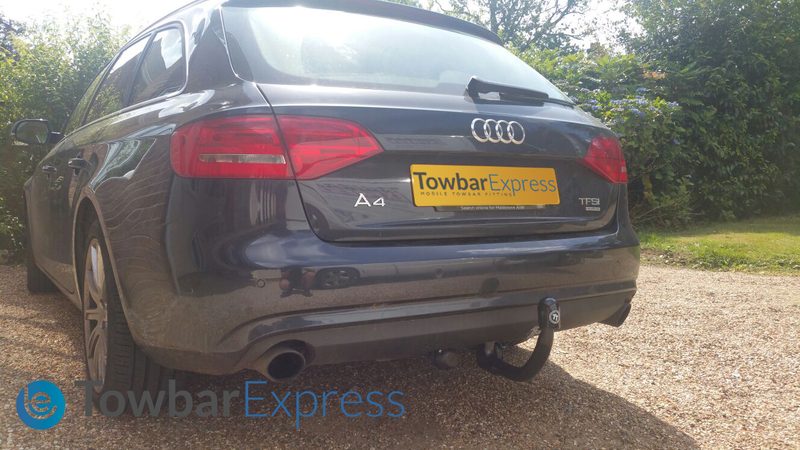 You can see our gallery of some towbars that we have recently fitted here. 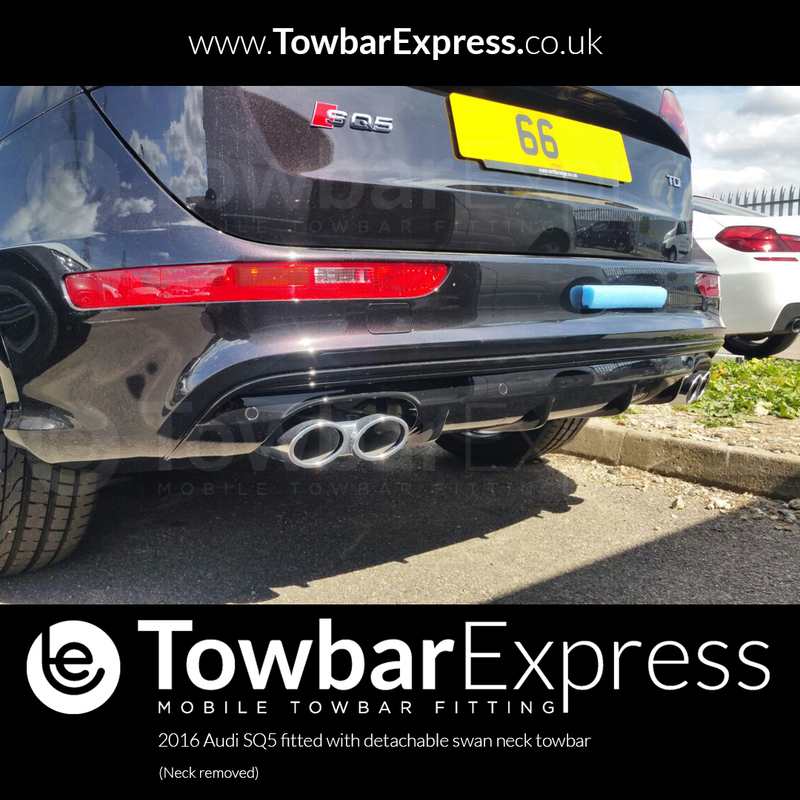 To get a quote for a towbar fitting you simply need to search for your car below, and you can book online now. 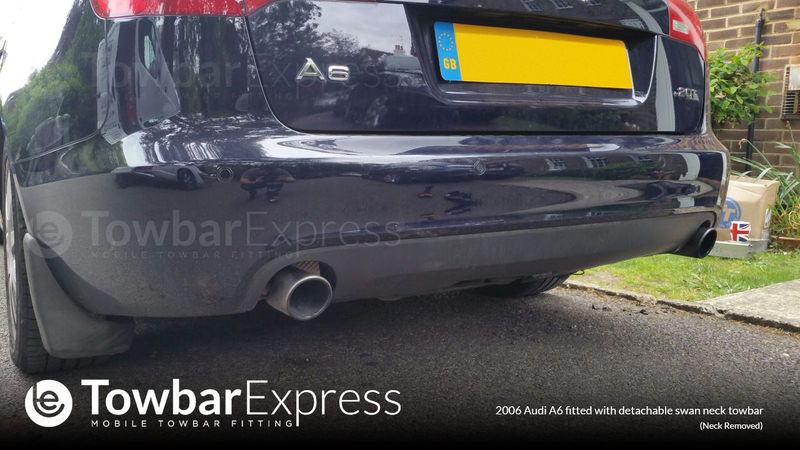 We take care of the whole job for you, from start to finish. 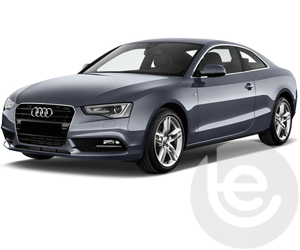 Audi was one of the first manufacturers to create an all-aluminium car, marketed as ‘space-frame technology’ because of its ultra lightweight frame combined with all-wheel drive. 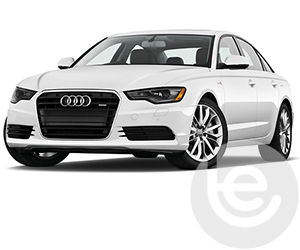 From the family-friendly A3 Model to the full-size luxury A6 Model, Audi offers a more varied portfolio than most would think. 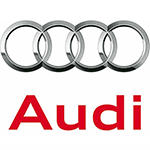 Audi has also been involved in several high-profile racing events such as the World Rally Championship, 24 Hours of Le Mans and the American Le Mans Series. 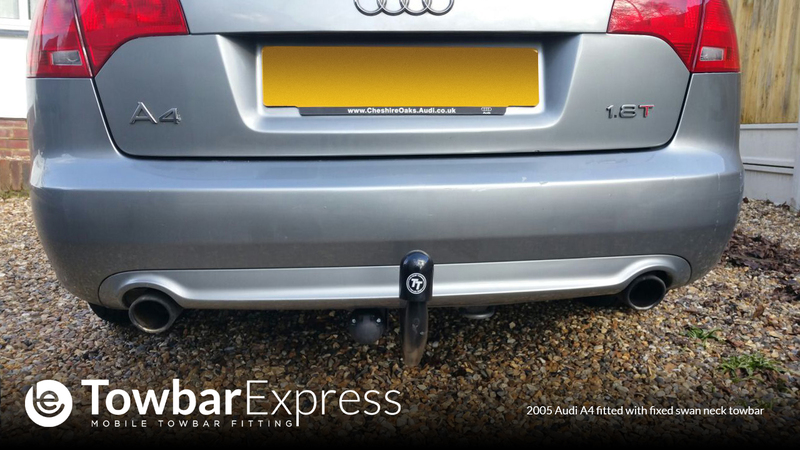 Audi cars are renowned for their high build-quality, performance and luxury styling, making them one of the best cars for any style of towbar. 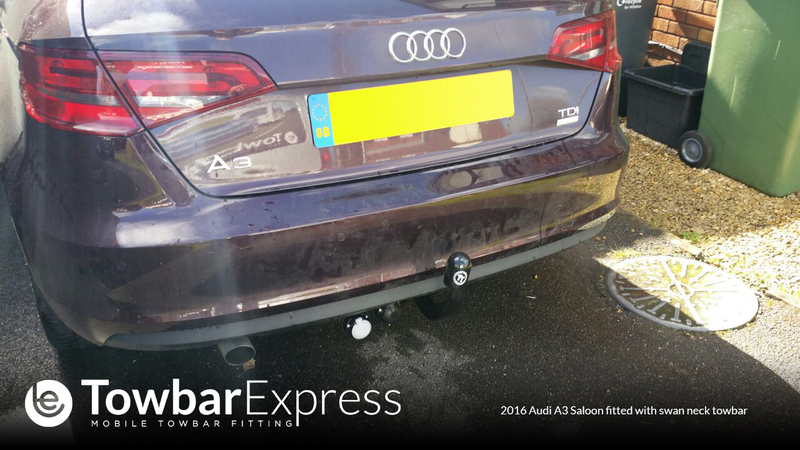 Of course with this type of car, only the best will do, you certainly don't want to spoil the looks of your car by fitting an ugly towbar. 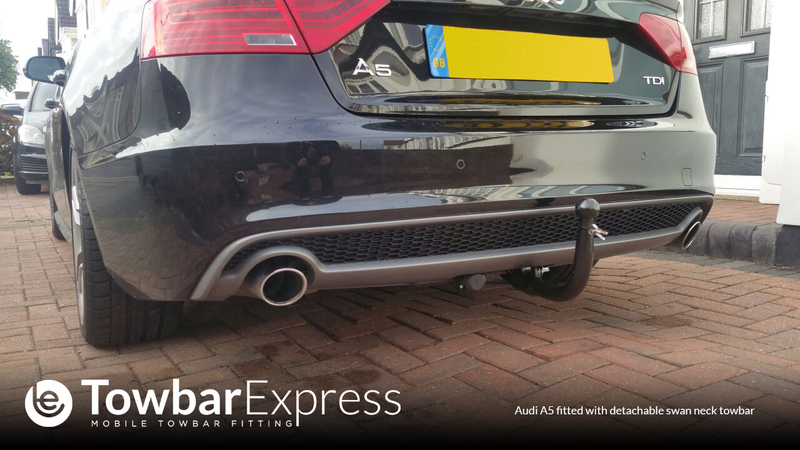 For this reason, we select the best towbars available from all the manufacturers; we always look for the neatest possible fitment for your car. 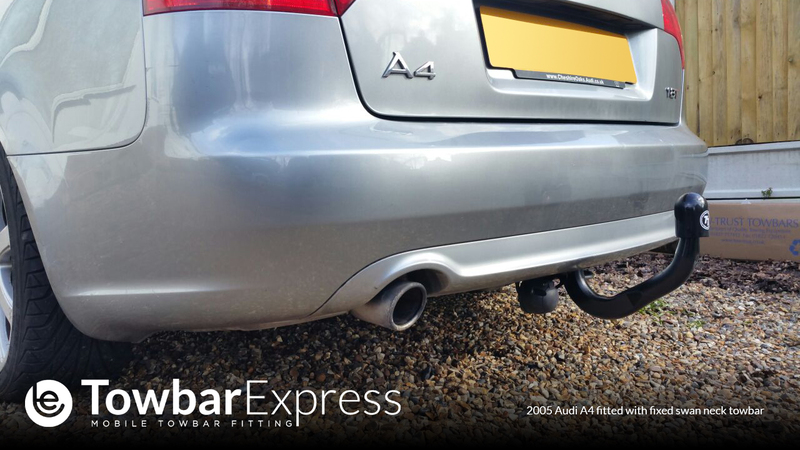 If your car has parking sensors, it is always best to avoid the fixed flangeball towbar, as the sensors may pick up the towbar neck. 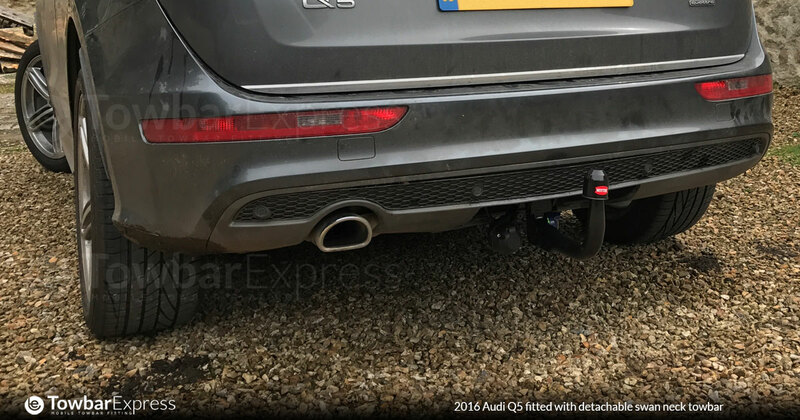 Some Audi models have a clip in panel in the rear bumper which is designed to hide a detachable towbar when the neck is removed. 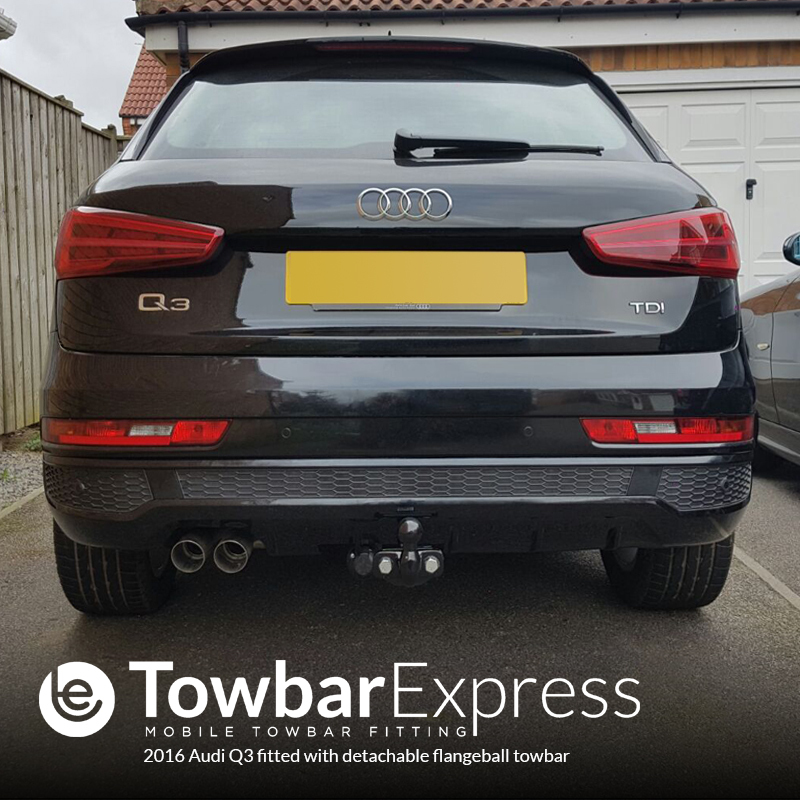 You may not have noticed the panel if you've never consider fitting a towbar before, so it's always best to check if it's there. 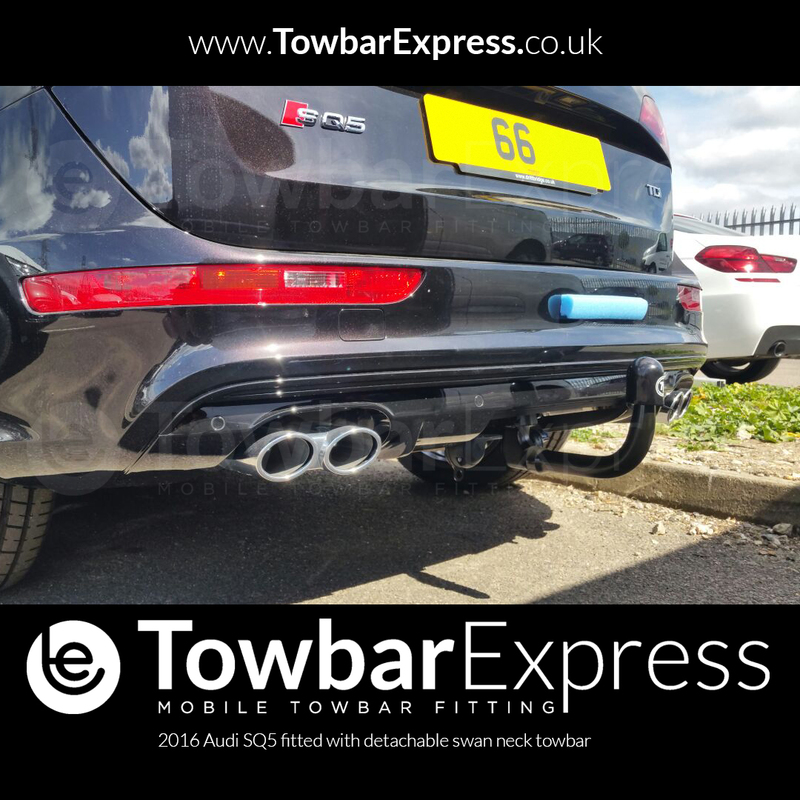 If your car has this it is best to select the detachable towbar option, because it makes a very neat towbar installation. 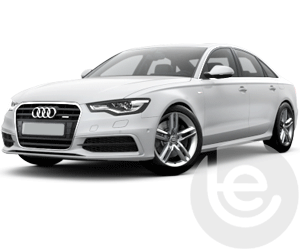 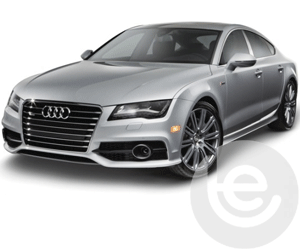 All newer Audi models are fitted with complex can-bus wiring which allows all the the cars complex systems to work together. 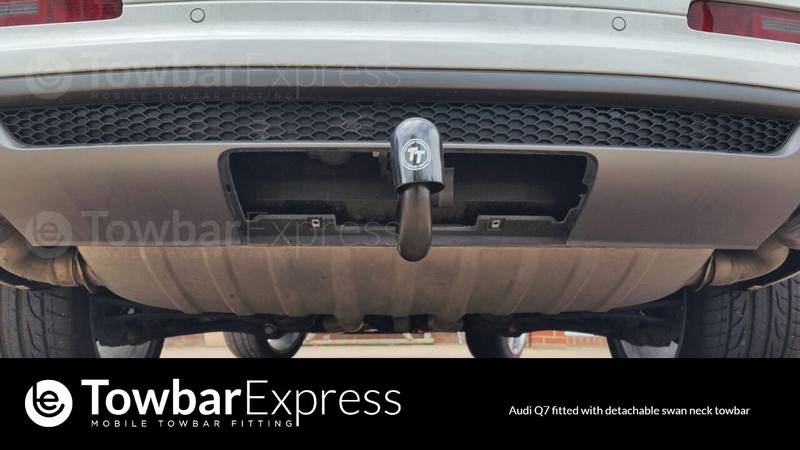 This functionality extends to the towbar wiring which allows built in safety systems, such as Trailer Stability Control, to work seamlessly with your trailer or caravan attached. 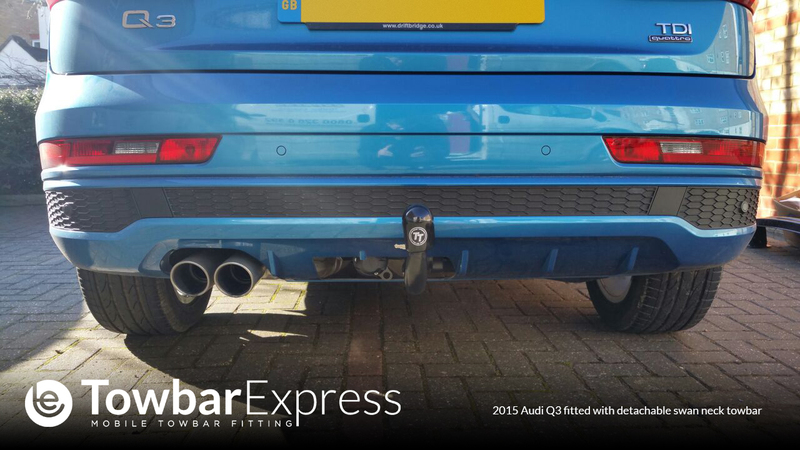 For this reason, we always fit vehicle specific wiring as standard. 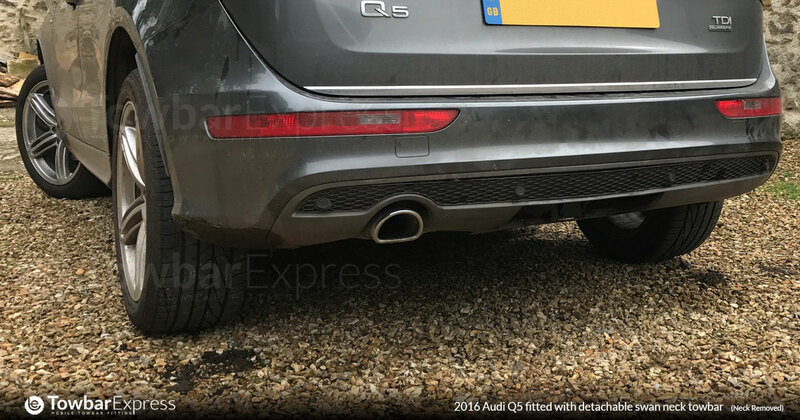 This is because the cars have built-in safety features such as Trailer Stability Control which can help prevent your trailer or caravan from getting out of control. 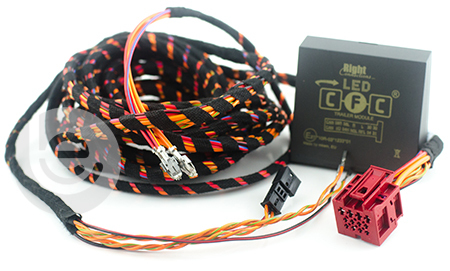 With aftermarket wiring these features wouldn't be activated so it is not suitable for the job. 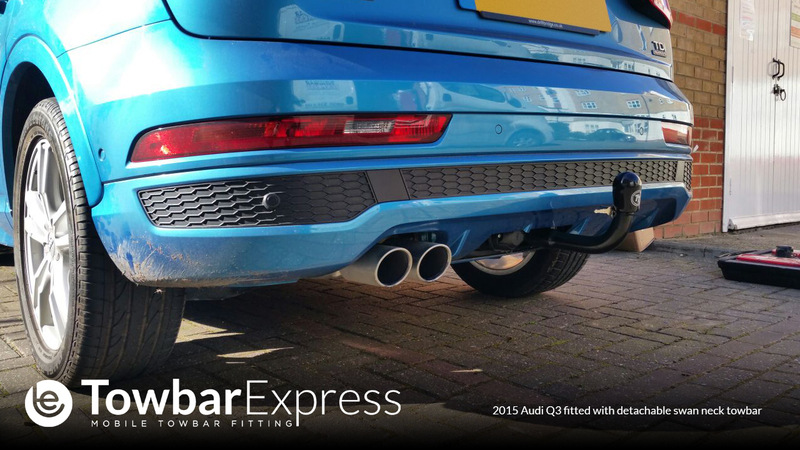 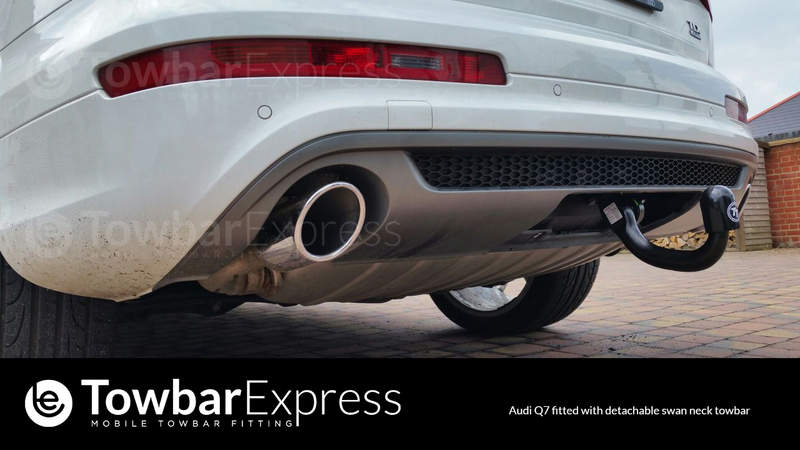 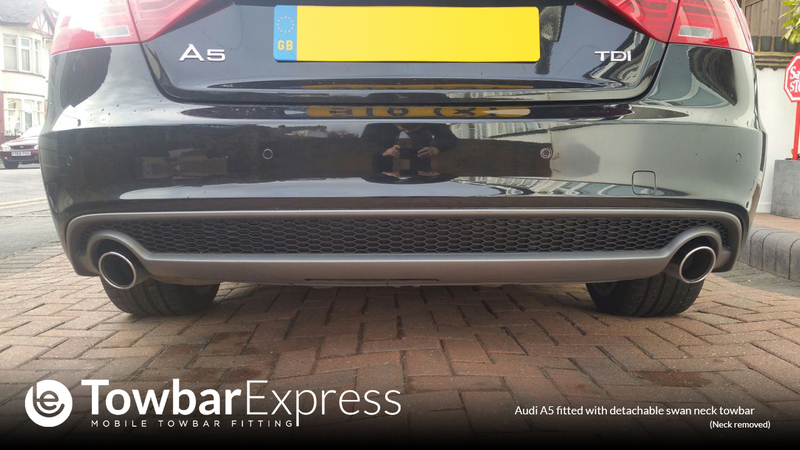 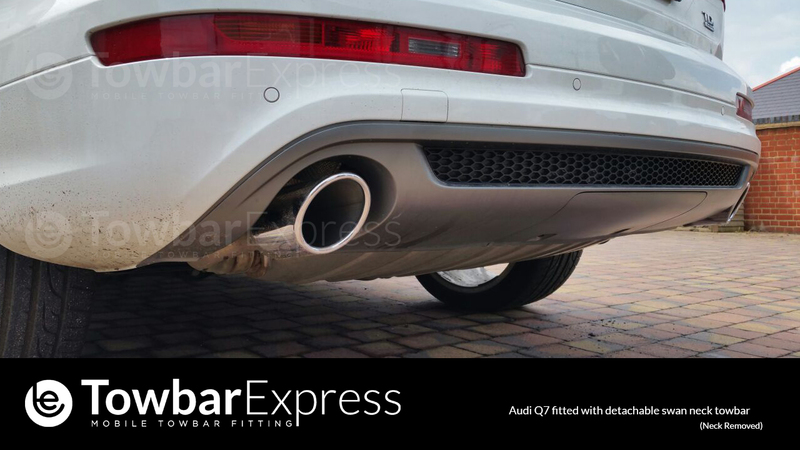 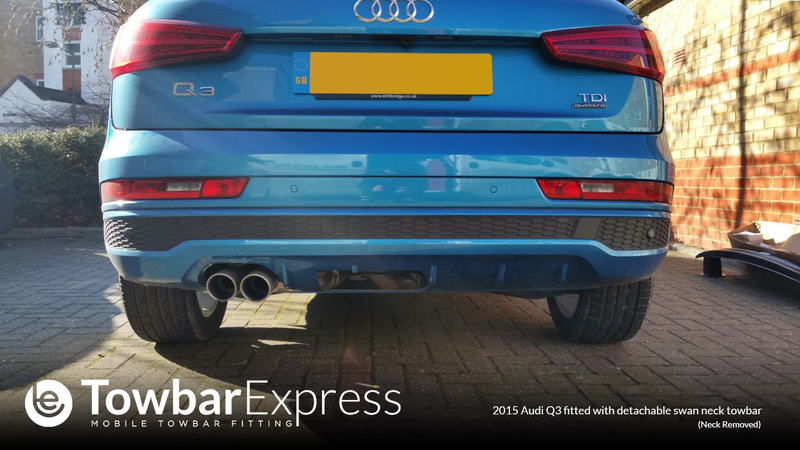 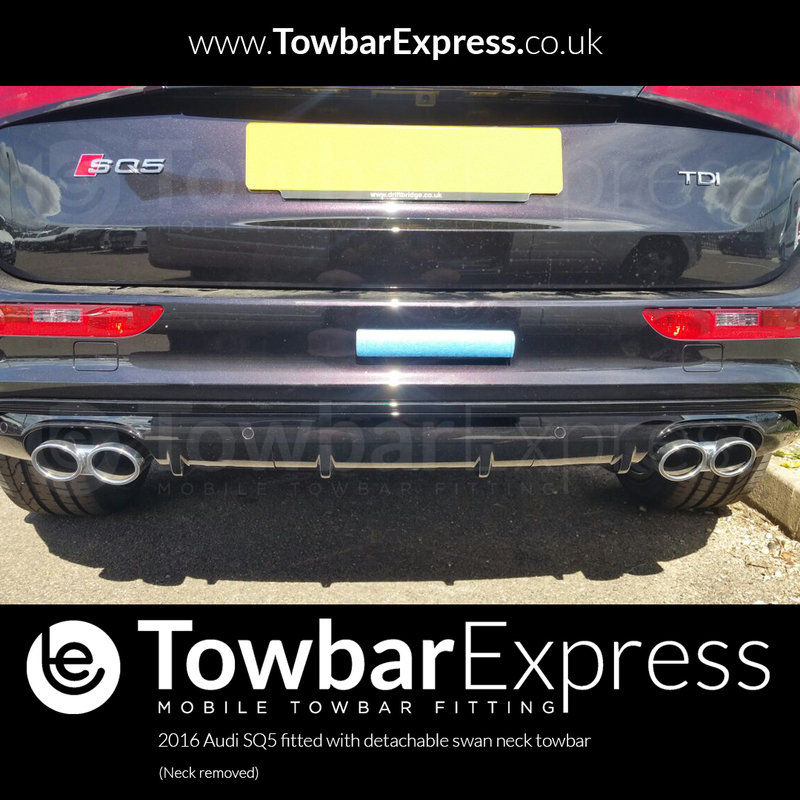 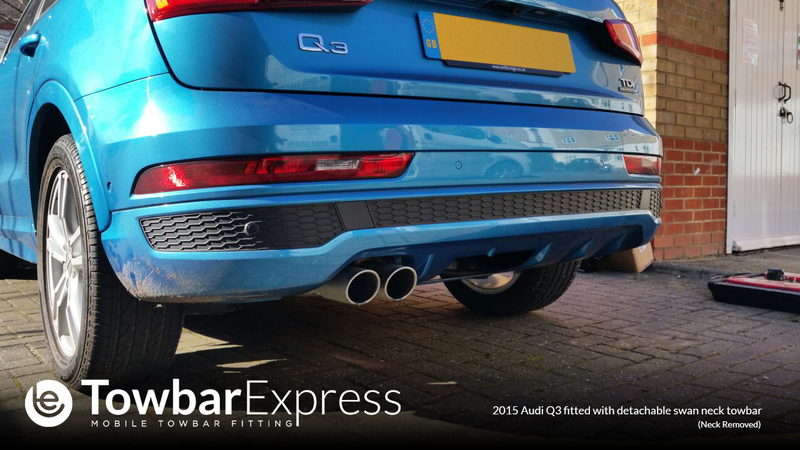 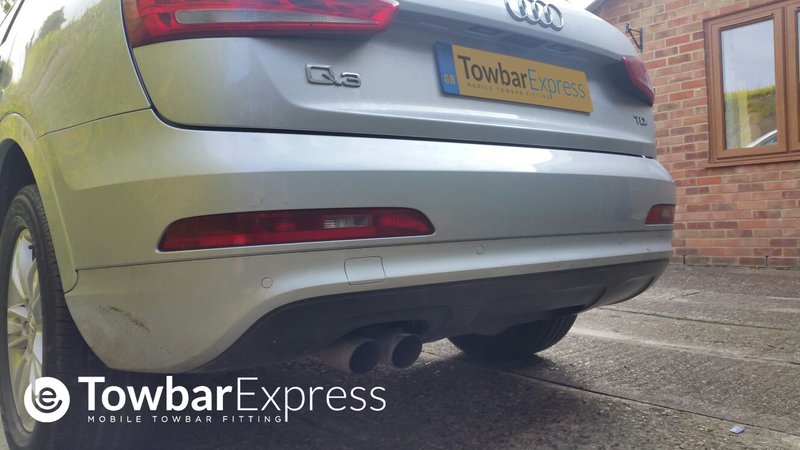 Why choose Towbar Express for your Audi towbar installation? 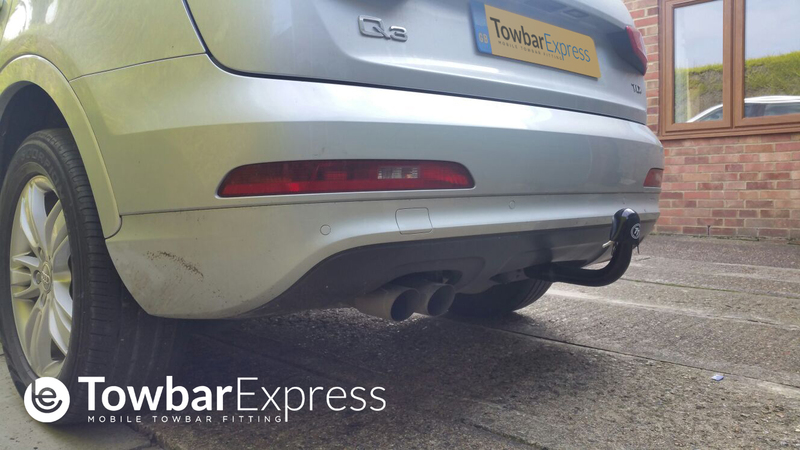 We directly employ, train and monitor all of our own towbar installers, therefore we can offer the the very best service that you expect. 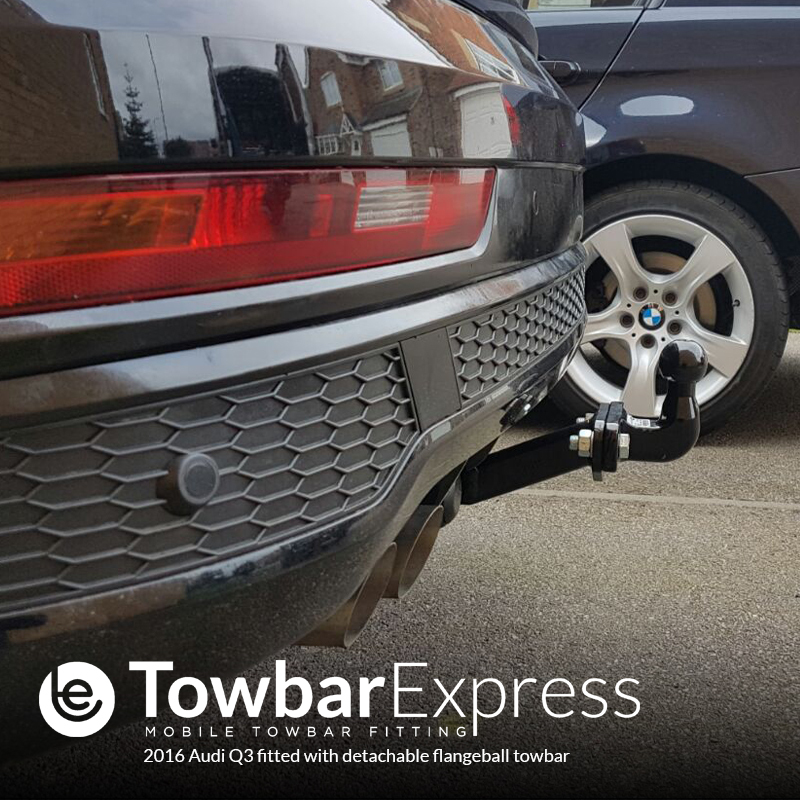 We will never simply contract out the installation of your towbar to a 3rd party company, or self-employed towbar fitter. 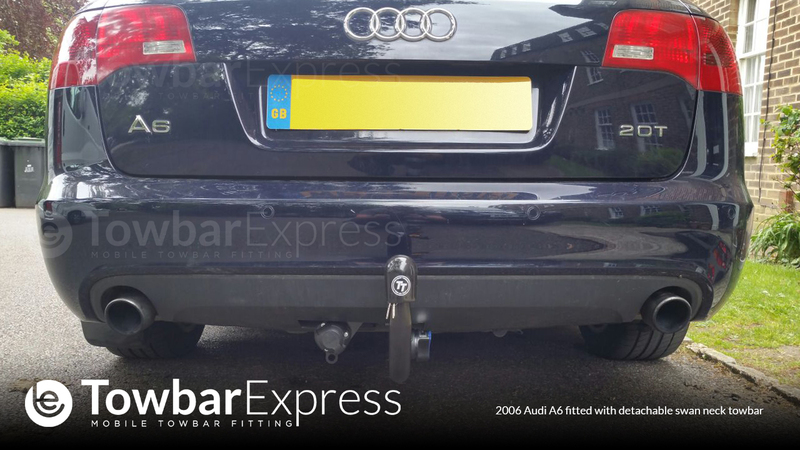 In addition to towbars, we also stock a full range of towbar mounted cycle carriers, and towing accessories.